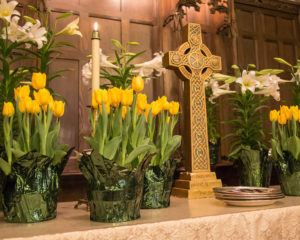 We invite you to donate a chancel Easter plant as a memorial or as a gift. The cost of a plant is $20.00 each. All orders are due by Palm Sunday, March 25. Click here for an order form. Attention members and families: Join in our joyful Easter tradition of delivering a lily plant to a member at home or in a local nursing care center. Plants will be available after the 9 and 11 am services in the front of the sanctuary.